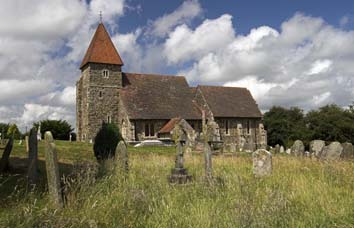 The nave is C11 and the tower early C12. The north aisle and chapel are late C12 and the chancel C13. The south chapel is late C13 and the aisle C14. Most of the interior was twice rebuilt in the late C19. Guestling lies at the point where the Wealden ridge meets the sea between Hastings and Winchelsea. The church, by a farm, is built of obtrusively repointed dark local stone. The high nave walls are not bonded into the tower, showing them to be older. The north west quoins are too fragmentary to be dated more closely than the C11, though Fisher thought them possibly pre-Conquest (p119). The VCH (9 p183) interprets some marks on the west wall inside the tower as indications of an earlier wooden one, but this is speculative. 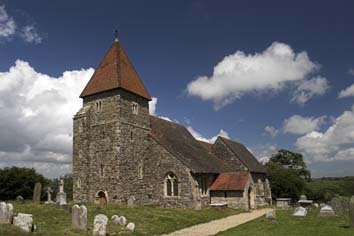 The unbuttressed tower is early C12 and has two unequal stages, the lower with two tiers of irregularly disposed round-headed windows, and a north west stair-turret. Before the C19 it had no west doorway (VCH ibid) and a small interior doorway, now renewed, was the only entry. The upper stage has double bell-openings separated by a baluster and a pyramid spire. Though not as high, it recalls the tower at Bishopstone. The north aisle has been heightened and widened, but retains a narrow C12 round-headed west window. A round-headed arch from the aisle into the north chapel is in part at least original with decoration recalling one at St Mary, Eastbourne, with deeply cut chevrons on the west side, semi-circular responds and foliage capitals. 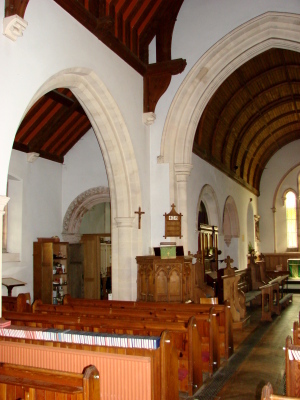 The present chancel arch and arcade are C19, but The Ecclesiologist of November 1846 (p182) records three irregular and slightly chamfered and pointed arches, inserted in an older wall; they sound later C12. Though renewed except for a few stones of the label, the two-bay north chancel-arcade is also round-headed and likely to follow the original form. It has double-chamfered heads and square responds and pier, whilst the inner orders of the heads rest on attached corbels. Despite the round heads, the chapel may have been little later than the aisle and was probably part of the same campaign. Nothing remains to show whether there was an earlier chancel. The oldest detail of the chancel is C13 and until 1886 it was one step lower than the nave (Langdon p186). Only the clasping east buttresses and the sedilia (see below) are obviously C13 today. The C19 east triplet with a shafted rere-arch replaces a mullioned window shown on the Burrell Collection drawing (c1780), which was C16 or later. The south chapel of c1300 is gabled like the north one with lancets (now renewed) and an arcade with an octagonal pier and small round shafts on the responds, which looks entirely renewed. Probably shortly after the chapel was finished, two-light windows with quatrefoils in the heads were inserted each side of the chancel. The Burrell drawing shows they have not been changed and some stonework is old. Inside, they are associated with a string-course at sill-level to the south, ending in a carved head. The east window of the south chapel may also have been altered at this time, for though the present tracery and shafted rere-arch are C19, a similar opening is shown on the Burrell drawing. The south aisle is also C14, but the arcade has only two bays – the form of the octagonal pier follows the original (Eccl ibid). 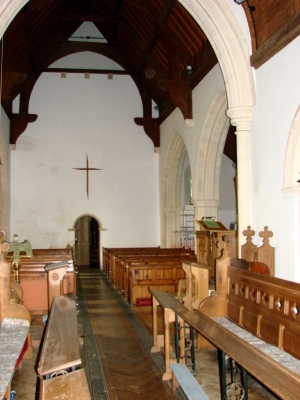 The dimensions of the aisle are unchanged and its date is confirmed by the mouldings and curling stops of the C14 south doorway, whilst the west window of the aisle has tracery of the period but is all C19, the other windows are later. The present porch is not old, but resembles the stone one on the Burrell drawing. There are visible alterations to the north aisle, which show it was heightened and widened, using larger blocks of stone, and there are two-light square-headed windows, like the south one. One in the north aisle is wholly C19 and the others were renewed, but the Burrell drawing shows that those of the south aisle are accurate copies. A bequest ‘for the reparacion of the south ysle’ in 1509 (SRS 42 p242) indicates the most likely date. There was another bequest in 1540/41 for repairing the steeple (ibid), but there is no obviously C16 work on the tower. After the Reformation several windows were changed, including the east ones of the chancel (probably) and the south chapel. The Ecclesiologist describes a ‘rude’ west doorway in the tower in 1846, which Quartermain shows to have been square headed ((E) p105). Otherwise, little changed until 1886, when the north arcade collapsed and A W Jeffery and W Skiller (ESRO 350/4/2/6) replaced it with a two-bay one of late C13 pattern. They also replaced the south arcade and chancel arch similarly; surprisingly Pevsner did not realise this and dated both arcades to about 1300 (BE p513). The roofs, the south chancel arcade and arch into the south aisle from the chapel were replaced, though a squint found near the east end (1 p196) was kept. Outside, the west doorway of the tower and the east windows of chancel and south chapel were replaced and most stonework was replaced or renovated. A new west window was inserted in the south aisle (for what was changed, see the Sharpe Collection drawing (1797)). Despite the thorough-going nature of this restoration, the cost was only £1500 (KD 1899). A photograph of the interior after this restoration shows little difference from today (ESRO Par 350/4/6), but a fire in 1890 undid much of it. The architects of the further one that became necessary are not known, but may have been Jeffery and Skiller again. Damage was clearly considerable, for the work that was needed cost £3600 (KD ibid), more than double the previous time. It was worst in the south chapel (Meads) and in consequence, little in the interior is old, apart from some remnants of the late C12 arches of the north chapel and a few details like the sedilia. In 2011 the exterior underwent restoration (vidi). Aumbry: (South chancel) Tiny and square with chamfered edges. Smaller than usual and on the south side, linked to the piscina and thus also late C12 (see below). Font: Sir Stephen Glynne noted a plain cylindrical one (SNQ 16 (Nov 1966) p267), but the present one dates from 1914. It is octagonal with carved sides and a marble shafted base. 1. (Centre window of north aisle) Pieces of C16 heraldic glass. 2. (South chapel, east and two south windows) Not dated, but all are close in style and one is signed by A Gibbs. Monument: (North chancel) John Cheney (d1603) and his wife and of standard type, with kneeling figures facing across a desk. It shows obvious fire-damage. Piscina: (South chancel) Round-headed and chamfered, it probably survives from the late C12 chancel and is linked to the aumbry. Sedilia: C13 with two seats and pointed and moulded heads, divided by a shaft with a foliage capital. It is as described by Hussey (p232) and is largely original, especially the heads.